The new full-fledged trailer of the upcoming Hellboy reboot movie is out. The new trailer is sort of confusing the tone of the film. The first teaser of the film that dropped weeks ago passed the movie off as a horror-comedy, contrary to the promises that the makers had made regarding the genre of the film before the production began. The new trailer focuses more on the fantastical elements of the film and does amp up the horror, but comedy has bee injected here and there. What's up? Can we pick a genre for the new Hellboy already? The first half of the Hellboy trailer is interesting. It introduces us to Milla Jovovich in her full devilish glory. But as the trailer reaches the end, things go haywire. Things start looking more and more like a graphic novel which would have been a good thing if that was the intended tone of the film. 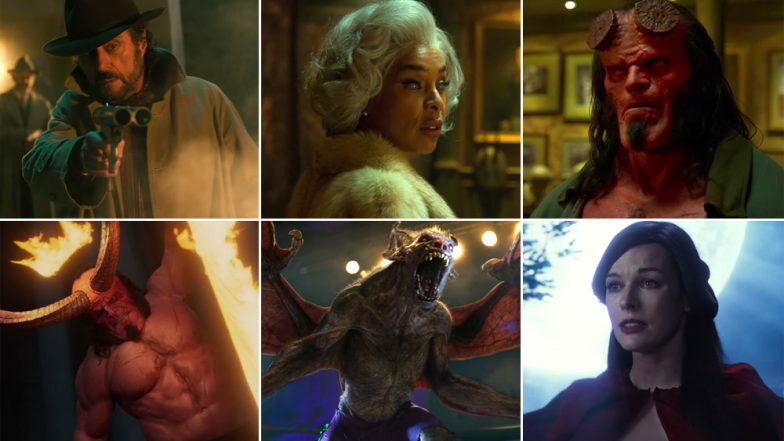 The VFX in the Hellboy trailer, near the end, dwindles between a campy B-grade horror movie to intercut scenes in a video game. Stranger Things star David Harbour stars as the titular hellish creature, working as a ghostbuster for Bureau for Paranormal Research and Defense (BPRD). Neil Marshall, known for the master horror film The Descent, has directed the new version with a new vision. Hellboy releases in theatres on April 12, 2019. The movie will be R-rated so that is something to look forward to. Oh, wait, just remembered CBFC.